14 Years Ago, Thinking the Unthinkable: “Was Margaret Hassan Sacrificed” by the British Government? Fourteen years ago today, Margaret Hassan, Head of Care International in Iraq was kidnapped. A month later she was murdered, her body has never been found. Her unimaginable plight and betrayal by the British government is outlined in the article below from 2006. Looking back over the carnage wrought in Iraq – ongoing – and subsequently Syria, with now the wider region threatened, her fate perhaps mirrors the hundreds of thousands martyred at home, in the street, market, work, resultant from the lies provided by Tony Blair’s government which gave George W. Bush the excuse for the illegal invasion of Iraq. Overnight the entire nation became hostage to the United States and remains so aided by another US puppet government, their captives continuing to die in unimaginable ways. Fly with the birds that grace the sky at dawn and dusk, Dear Margaret, with all those lost in this catastrophic wickedness. All live on in hearts beyond counting. 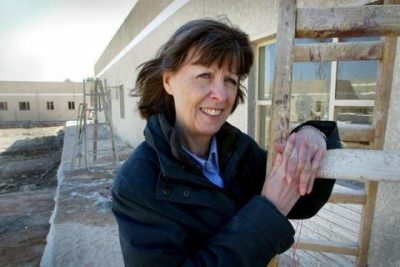 This week, Deidre Fitzsimons, sister of Margaret Hassan, Head of Care International in Iraq, believed murdered after being kidnapped in October 2004, spoke out for the first time. In a searing interview. she concluded: ‘Was she sacrificed?’ (By the British government) Was she? Margaret stayed in Iraq through the eight year Iran-Iraq war, the 1991 carpet bombing, the thirteen year US/UK bombings and sanctions. Tony (‘I’d do the same again’) Blair called her killing ‘abhorrent’. Indeed. According to Fitzsimons the kidnappers called her husband Tahseen Ali Hassan, four times on her mobile, requesting to speak to the British authorities in Baghdad : ‘they never asked for money.’ Astonishingly, the British refused, saying the calls were ‘a hoax’. But, states Fitzsimons, the day after each call, a video was released. After the last call, the Embassy in Baghdad bizarrely told Hassan to call the Care office in Cairo. With Baghdad and the British and Americans, holed up in their gate crashed palaces, bristling with security experts of every kind, it seems no effort was made to monitor calls – or extraordinarily, trace the location of the mobile – a routine policing operation. Strangely, in the other high profile kidnapping, that of Ken Bigley, he had a Thuriya phone with him – also traceable – on or off. According to his brother Paul, it seems no effort was made in that case either. Ken Bigley also had one leg virtually rebuilt with titanium, resultant from an accident. Titanium can be picked up by satellite surveillance, which Iraq’s skies are also bristling with. Again, requests were refused, states Paul Bigley. Simple phone tracing may have saved both lives. Fitzsimons described her brother-in-law, alone, in his and Margaret’s home, receiving calls from those holding her, utterly helpless, grief stricken, abandoned. The day after the last call, she was killed. The bizarre official excuse for refusal to speak to the kidnappers was they were distancing themselves and stressing her Irishness (she was Irish born) but Blair had unhelpfully castigated those holding her on day one: ‘Now we know what sort of people we are dealing with, holding a wonderful British woman’ like her. It transpires she had triple nationality and the kidnappers had her British passport. There is anyway no Irish Embassy in Iraq. On Monday 5th June, three men were brought to Court in Baghdad, charged with Margaret’s murder and abduction. They had been held in custody for a year. The family, says Fitzsimons, had repeatedly approached every relevant British authority to interview them in the hope of learning the location of Margaret’s body. They were refused, she says. They pleaded for British representatives to go to the trial and interview them, also refused. The Irish government, reliable insiders say, were not told of the trial by the British and learned by accident and instantly sent officials who arrived barely in time. The Irish Foreign Minister has said it would be ‘helpful’ if the British would release to him all the material on the case. The ‘trial’, as so much, raises more questions than answers. Mustafa Salman, was jailed for life for ‘aiding and abetting’ kidnap, the two others were released. Iraqi police allegedly raided his house and found make up, handbag and Margaret Hassan’s car number plates, which it is said was given him for safe keeping by a friend. Kidnapping is not a souvenir business. It is an unusual kidnapper who doesn’t dispose of the evidence. Details of the reportedly just two hour hearing are minimal. And given the horrors of torture and abuse in Iraq jails, had Salman had any idea as to the whereabouts of Margaret’s body, he would have surely told. The puppet Prime Minster Nuri Maliki, engulfed in Haditha’s and numerous other culls, Basra’s civil death throws, vowing to ‘crack down’, his Ministries squabbling, empty or awol, perhaps sought to divert the nation.Yet the briefness of the trial is inexplicable and Salman has the unmistakable feeling of ‘scapegoat’ who has had items planted on him. Whatever the truth, those responsible for all Iraq’s torments are far away, ‘ like Pontious Pilate, washing their hands’, to adapt a Vatican envoy’s comment on Kofi Annan. ‘The most disastrous war since Maurice Aurelius sent his legions to Germany in nine hundred BC and lost them all’, was necessary to civilize a nation beyond the pale? Moreover, did Prime Minister Blair have it in his gift to save them both? If the demands were genuine, in both cases, they were for the release of all women prisoners. The pain and shame of arrested women is a running national sore. When the invasions finest kick down doors at 3 a.m., and terrorize dazed, sleeping families, they routinely take away the women as bargaining chips if the men are not there. Shameful, illegal, immoral. Kidnapping infact. After the horrors of Abu Ghraib, there have been repeated, reliable reports from numerous sources, that the US transferred woman from some prisons in Baghdad to custody of British ones in Basra. Bush and Blair kept the line that the only women prisoners held at the time of the kidnappings were Minnesota University graduate, environmental biologist Huda Ammash and her colleague (both subsequently released, after three years, without charge.) If the Basra claims are true, Anthony Blair Q.C., could have done something legal in Iraq for once: released the illegally held women prisoners and he just might have saved two terrified, innocent British passport holders. It must be wondered what advice Blair’s ‘Human Rights Advisor’ on Iraq, Ann Clwyd – long time associate of the British and American governments’ favourite convicted embezzler, Ahmed Chalabi – must have been urging over the all. She must have been distraught. I seem to have missed the Press Releases. And when factions in high places, allegedly threatened Times columnist, Matthew Parris‘s wealthy friend, prepared to pay a ransom for Margaret Hassan, were it demanded, in to a state of terror for the safety of his family; confiscated Paul Bigley’s communication equipment, when he was fighting for his brother’s life and telephoned this correspondent demanding broadly: shut the f … up about Margaret Hassan, was it because the decision to do nothing had been made and humanity and drawing attention to the real people behind the names muddied the planned spin? Unthinkable, of course. Oh, and of course, conspiracy theorists might wonder if those mobile phones were infact traced and a decision made to simply do nothing. However, the Islam Memo correspondent (translated from the Arabic, courtesy Imad Khadduri) managed to enter the area the day after the killing. ‘More than fifty homes were completely destroyed. Homes at five hundred metres away suffered heavily’ (two massive five hundred pound bombs were used). The Iraqi police who first arrived at the scene removed many charred bodies … the bombardment even melted the iron beams of the roof and windows of the homes. ‘I would not be surprised if Ken and Margaret’s bodies weren’t in some refrigerator in Washington to be produced at an opportune moment’. Unthinkable. Veteran war correspondent Felicity Arbuthnot was a close friend of Margaret Hassan. This article was first published by Global Research on June 10, 2006.